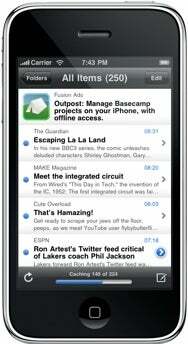 Your choice of Google Reader clients for iPhone has expanded yet again with Phantom Fish’s release of a free version of its popular contender, Byline. Last month, Phantom Fish launched a major 3.0 upgrade to Byline that brought easier feed browsing, article sharing, automatic offline caching for truncated posts, and more. The paid version of Byline is $5, but now potential customers can nab a new, free version that is supported by Fusion Ads. Byline Free includes all of the features of its big brother, so it can effectively serve as a free trial for the paid version or simply as an alternative way to support its developer. Like the free version of Twitterrific for iPhone and many other ad-supported apps, users will see only one Fusion Ads ad for every ten items. Byline Free requires iPhone OS 3.0 or later and is available now in the App Store.